Kimochi Red Light (NSFW), a new crowdfunding site aimed specifically at games for a “mature” audience, launched today and has already gathered almost $20,000 in funds. Kimochi sprouted from Nutaku (also NSFW), a gaming portal for 18+ games and visual novels. Nutaku proudly proclaims Kimochi to be the first of its kind. If you think you know what’s on Kimochi…you’d be correct. It’s an offshoot of a pornographic site the likes of which most of us have seen before. That being said, some of the games on display look legitimately fun and appealing, in ways besides the obvious. Three of these campaigns have already surpassed their funding goals. So far, Kimochi managed to pull in over $18,000, and no single game has raised less than $800. Some of the campaigns seek to expand on games already in development. The creators of Battle Girls plan to expand their soon-to-be-released game with the funds they’ve raised. All of the games shown so far – like most of the content on Nutaku – show off female eye candy, which shouldn’t be a surprise. According to Alexa, the site’s users are overwhelmingly male. That said, at least one game – Echo Tokyo: Phoenix – features strapping men in its roster of supporting characters. Some of the goals on the site are a little ambitious, to say the least. 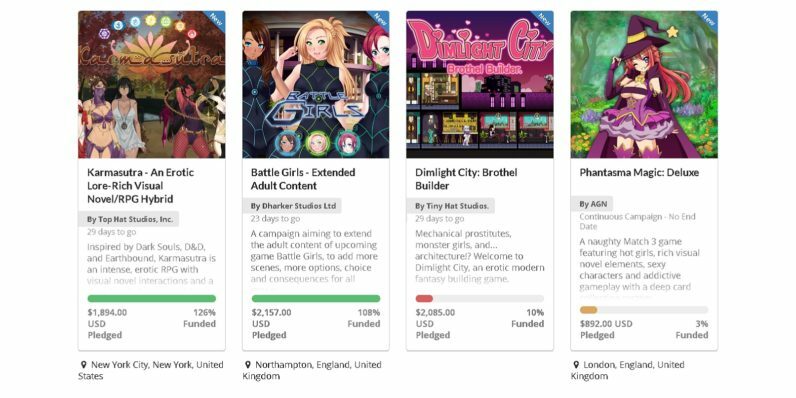 Dimlight City has a pledge goal of $20,000, and that would all go towards additional content. They apparently need the money to pay their contract workers to make more content, which is understandable. In a move that shows a solid understanding of their audience, they offer to send their most generous backers to an actual brothel. The creators of Kimochi Red Light say they take no percentage of the funds raised for the games on their platform. All proceeds go directly to the game-makers. While that’s commendable, there’s always a chance the game-makers could go AWOL like some Kickstarter projects have. The site raised a hefty chunk of its change during a soft-opening for beta testers in January. Only time will show if this site can launch as many games as the tamer crowdfunding sites have.